I’ve been hearing a lot of good things about The Bruery, albeit that they are relatively close and the freshness factor is a BIG plus. 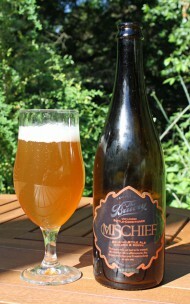 I saw their “Mischief” at my local beer store and picked up a bottle. How could I not, with a description of “hoppy” Belgian pale ale slapped across the label. Kiss me bottle, me loves you. The beer is poured into a brand new glass, perfectly matched for just the occasion. The pour is a beautiful yellow hay color that fades to a nice creamy white haze around it’s edges. A refreshing pool of “quench” that holds up a nice thick head with perfect lacing. The nose is citrus and Belgian yeast. Banana & lemon with slight hint of hops in the distant background. I go in for the taste. Spicy clove and citrus. White pepper snaps at you real quick. The malt and hops are near perfect in balance. Carbonation is high but yet goes down pretty dam easy. The 8.5% is well hidden and considering this beer drinks like a summer beer. Extremely refreshing which really hits the spot today with the weather being 95+ degree’s. Overall, the quality of this beer is near perfect. You can tell that real some serious craft went into this and I highly recommend if you see this at your local beer store.